Automotive Brake Calipers Market size is estimated to surpass USD 25 billion by 2024; according to a new research report by Global Market Insights, Inc.
Remanufacturing of product is an emerging trend that has gained traction among the automotive brake caliper market participants, especially in developed regions. This has led to considerable reduction in overall product cost and carbon footprint during production. Production of light weight aluminum caliper and enhanced fitment will further induce immense potential to the industry size till 2024. 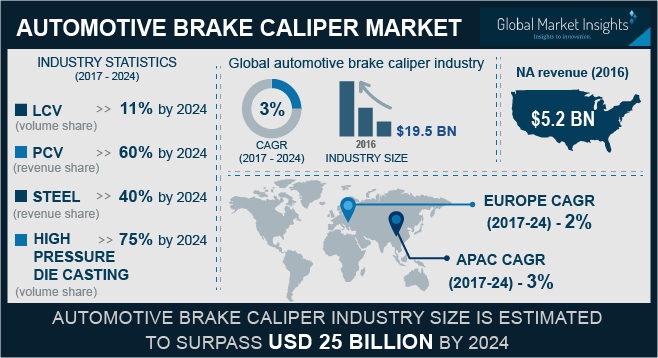 Automotive brake caliper market from OEM will dominate the industry share owing to their mandatory installation in the vehicles. Substantial automobile production across the globe has resulted in increased foreign direct investments, especially in the developing countries will further support the industry dominance. Aftermarket will grow rapidly, witnessing over 3% CAGR from 2017 to 2024 owing to cost effective nature of the products as compared to the counterpart. Development of multi-piston caliper offering enhanced operations will further propel the industry growth. Steel is expected to dominate the automotive brake calipers market with over 40% share over the forecast timeframe. The material possesses excellent mechanical properties including corrosion resistance, durability, and stiffness, due to which, it is highly preferred by the industry participants. Moreover, cost effectiveness as compared to the counterparts will further support the material’s dominance till 2024. Phenolics will gain high momentum, exhibiting over 3.5% CAGR owing to benefits such as high strength, lightweight, etc. Asia Pacific automotive brake caliper market will grow rapidly at over 3% CAGR from 2017 to 2024. Superior manufacturing facilities along with substantial vehicle production across the region will primarily support the regional growth. High demand from countries including China, India, and South Korea will further escalate the revenue generation. North America accounted for over USD 4.5 billion in 2016 and will grow significantly over the forecast timeframe. Product offering via online channels coupled with increasing sales of LCVs across the region will strengthen the industry penetration in the region. Rising adoption of disc brakes in PCVs will further foster the regional growth till 2024.